The African continent has demonstrated commitment to promoting gender equality and the empowerment of women. Almost all countries have ratified the Convention on the Elimination of All Forms of Discrimination against Women; more than half have ratified the African Union’s Protocol on the Rights of Women in Africa. Other milestones include the African Union’s declaration of 2010–2020 as the African Women’s Decade. Although Africa includes both low- and middle-income countries, poverty rates are still high. The majority of women work in insecure, poorly paid jobs, with few opportunities for advancement. Democratic elections are increasing, and a record number of women have successfully contested for seats. But electoral-related violence is a growing concern. Through regional offices in Dakar and Nairobi, and a number of country and multi-country offices, UN Women implements programmes tailored to individual countries, in close collaboration with governments, the UN system and civil society. Our strategies to promote women’s participation in decision-making include engagement with national electoral systems and political parties to provide an equal playing field for women candidates. By supporting leadership development, we assist women politicians in cultivating their skills. The growing integration of gender in national planning and budgeting draws in part on our strategies to institutionalize these processes, train national officials to execute them and strengthen the abilities of women’s movements to advocate for and monitor them. Broadening space for women’s participation in peace processes entails training women mediators and advocating gender equality measures as critical to security policies and practices. We also work to improve vital services for women in conflict and post-conflict areas. Towards ending violence against women and girls, UN Women calls for adequate services for all survivors, and backs the replication of good service models. Our programmes also help strengthen policies and laws against violence. While women are a source of economic vitality across Africa, discrimination hinders their opportunities. We support critical policy dialogues on decent work and social protection, especially for marginalized groups. Partnerships with national banks are expanding access to finance, while collaboration with regional and UN economic commissions is galvanizing support for women as leaders in cross-border trade. Visit the Africa regional website for more information. The 2012 invasion of northern Mali by rebel and Islamist groups displaced over 500,000 people, the majority women and children. 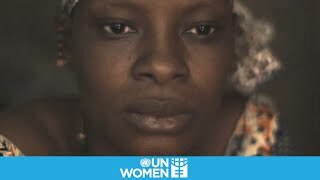 Watch the story of two displaced women who give new direction to their lives with the help of UN Women grants. Khadija brews and sells hibiscus tea in Mopti market, while Aguechatou is a tailor who makes colourful women’s clothes.